I made two more molds of Fomorian heads, one with a single head, the other with the better four of the batch that has been sculpted so far. My initial resin pull the other day must have been beginner's luck, because tonight I had a lot more trouble -- especially with that mold. In fact, it got a bit torn up from trying to retrieve heads from the cavity. I was having problems with bubbles at the small joint between the head and the "funnel" into which I pour the resin. I got better at avoiding this, but what really made the difference on the last two pulls was using a syringe to fill the head with resin. 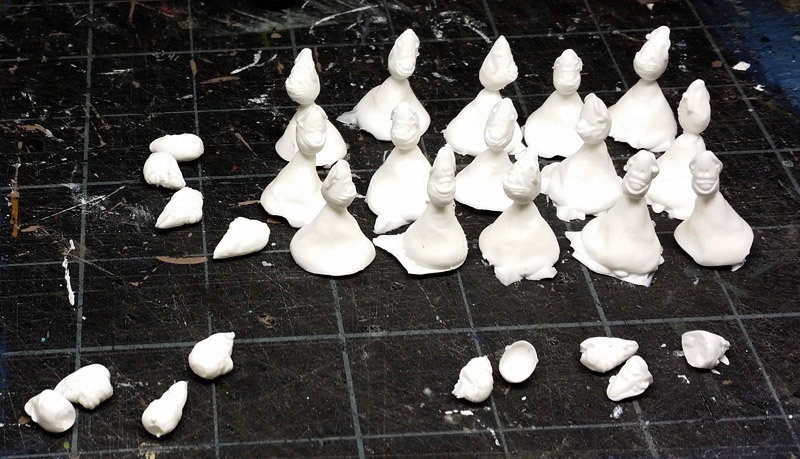 That's 19 good heads, four more that have small bubbles at the back of the head (simple fix,) and five bad heads. Of the five, I could probably reconstruct the back of three heads, or they may become the start of converted variants with some sort of headgear/hood. The other two are unusable for anything. I should start thinking about getting my hands on some more Reaper orcs (I only had the one) so I can see if I can sculpt & cast replacement feet, or whether I will have to sculpt them on each individual figure. Good luck! I can't wait to see how these turn out. You single-handedly doing much to bring Fomorians off the endangered species list.